Your lawn is often the first impression people get when they visit your home or business so make sure it is in tip top shape. From residential to commercial spaces, we make sure your lawn space is regularly maintained and always in the best shape for Liberty residents. We offer different servicing frequencies, including bi-monthly and weekly maintenance work. 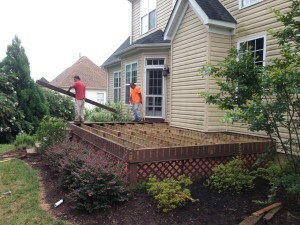 For a decade we have been providing lawn maintenance Liberty, SC can trust. That means trusting us to show up on time, and complete the job just how you want it. Mowing, edging, pruning, bed weeding, leaf removal, fertilization of turf grass, and ornamental trees and shrubs. Since the appearance of your yard-space must be regularly maintained, we work with you to establish proper care for the overall presentation of your home or commercial space. Every Liberty resident deserves to have healthy, strong flowers, trees and grass, which is why Cochran Landscape is the best option. Call us today, you will not be disappointed! Here is a great site from the people at Scott’s Miracle Gro that can give you a great idea of the different aspects of lawn maintenance.